Oh my! This is gorgeous. An almost lost art. I hope, one day, she will teach others. What a wonderful skill! I'm so glad it's not being completely lost for future generations. I've always wanted to learn how. I have the shuttle and all the supplies but never seem to have the time to just sit and do it, so it's moved to my retirement to do list, lol! I know nothing about tatting but that is beautiful!! 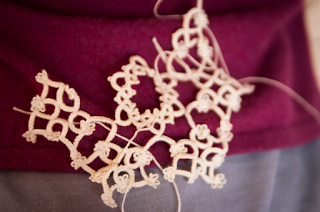 I think when I have gotten over my knitting obsession, I'd like to resume tatting. I learned shuttle tatting once upon a time, although I did have to take a class. Could Clara explain why needle tatting is easier? I've heard that from others. Absolutely beautiful! I took a class on shuttle tatting a couple years back. I made some trim, a bookmark and decorative heart. It was challenging for me. I am so impressed that Clara taught herself! She is truly a gifted young lady! I have shuttle tatted for about 35 years...I was self-taught also, but admit I did have to watch someone else actually tatting at a craft fair before I could understand the written instructions. It requires my complete attention and that's why I don't attempt it when there are distractions around. Therefore, I knit when the tv is on or grandchildren are around. Clara is doing a beautiful job! I have considered taking up tatting, although probably not within the next 10 years (too many other competitors for my brain space right now). I have wonderful linens that I inherited from my grandmother and great-grandmother, with embroidery, tatting, etc. that they did themselves and used to embellish the table runners, pillowcases, tablecloths, etc. I absolutely love it--so delicate and almost ethereal. And artistic! Clara reminds me of my college roommate who could tat; crochet and read P.G. Wodehouse at the same time; and missed her spinning wheel (too big for the dorm). Is there no end to her talent? My mom knows how to tat--I should ask her to teach me--it is a dying art. Love that delicate snowflake!